First of all, an open invitation. That means it’s open to anyone, regardless of … anything. Is anybody interested in meeting up for time out doing macro in the nature? I know my own locality but others can be considered. I got a van recently, at present it has seating for 5 and loads of space for any gear. It’s on its way to being a camper, maybe, a work in progress. The idea is to go somewhere natural, near water and bush/garden, for early morning shooting, as the sun comes up, before it gets too hot. Afternoons are good too, you just have to be better prepared, and to start out into the night which can be as good but different. It’s an idea, if anyone is interested or has a suggestion comment here or click Contact, for email. The first egg, of many to come, unless the nest is destroyed. It’s what people do in fear and lacking understanding, not to mention the care it takes to avoid disturbing a nest of this kind, situated as it is and in proximity to people. 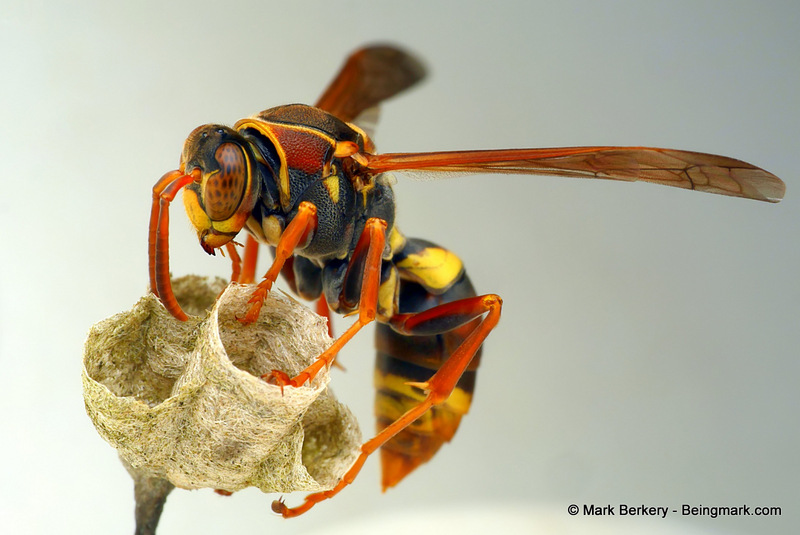 She can be dangerous, fierce in her protection of the nest, with a sting she’s famous for. But not so careless as to throw away her life without cause. And so is the window for mutual respect, due care and attention to her needs. After using a small 12″ laptop for 5 weeks I really appreciate these pictures on a bigger 24″ screen. So much better, more detailed, and easier on these old eyes. If you are on a small screen see them on a bigger one, even the TV. From three cells to four, future development in mind, she builds her castle a room at a time. 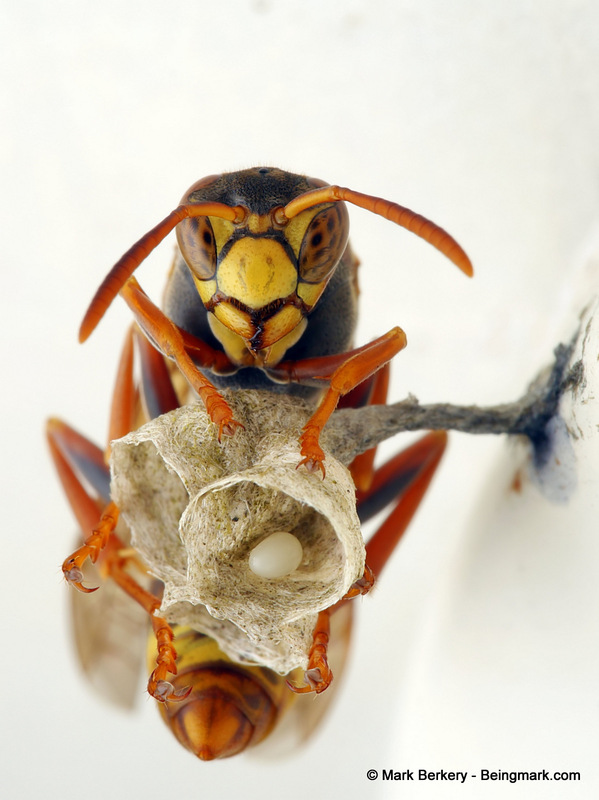 She uses her antennae to listen to her egg developing. I’m sure she can hear things we can’t. And isn’t she photogenic, against a clear background. Day and night she climbs all over the nest, checking for any flaws in the structure or signs of invasion by other creatures that would take advantage of her work. Watching out for the health of the egg. Such is nature, ever vigilant. Here she is laying the second egg. It’s as close as I could get without risk of disturbing her or the nest, and that wouldn’t do for my photogenic friend. I would have her survive the season without having to move home mid-birth. After a short while photographing her she got used to me and no longer made those staccato dancing moves that indicate she is on the verge of alarm. If I had stayed longer she would have come to accept me as part of her nature and so would the offspring, though still wild, make no mistake. Some of the best safaris happen in the garden. 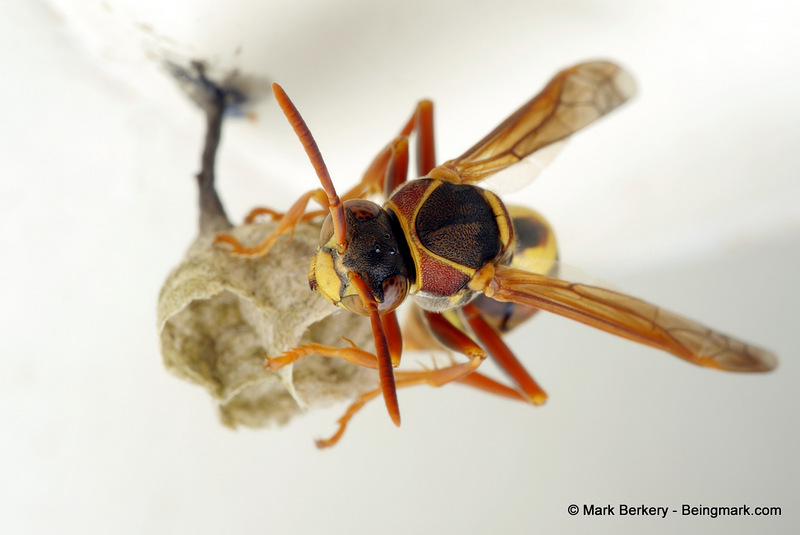 Not long after I got to Pomona, my house sitting gig, I noticed this queen paper wasp nesting in an out of the way place. So I observed her a while. Over the weeks I was there the nest grew slowly from three cells to five. So she was preparing for the future, a castle for her little dynasty. I didn’t see her come and go, to gather the materials for the building. In fact I thought she was conserving herself, for the first egg to grow. Some would take off and start the process somewhere else, and on it goes. That’s nature, never ending, always burgeoning. No matter what we do to the earth, and we are doing more than can be told, she will survive. But things will change. And ‘adapt or die’ will echo through the psyche, as it has down the ages. Forms come and go, life goes on. No point in lamenting the past. It takes pain for Man to change, unfortunately, or not. So it is we develop in time, until time’s up. Maybe it’s all just apparent. every new series of yours leaves me speechless, it’s just amazing how you capture these beauties of nature. And I’m sure that all those who ever tired to take photos like these (including myself) and never came even close to such results can appreciate what perfection you share with us. And thanks again for sharing the details of your work on beingmark. Thanks for your kind comments. 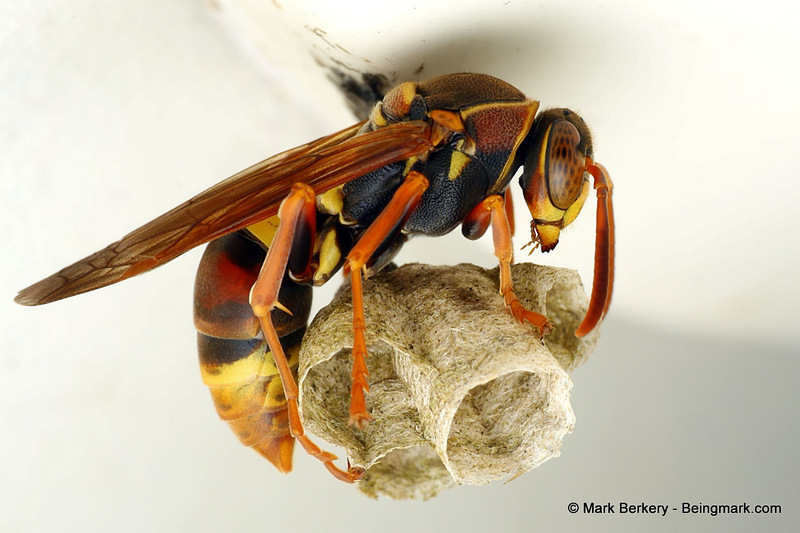 The wasp was in fact one of the easier captures, since she’s tending a nest and everything else is secondary – including me – and gave me an advantage. In case you haven’t seen it, my take on macro is here – https://beingmark.com/macro-illustrated/ – if you apply the principles diligently you will find it works. Great series of images! Wish I could take you up on your offer but we live on opposite sides of North America!! I’ve followed your works for some time, you have a wonderful talent. Thanks Bev. Brisbane, Australia here. Not Brisbane CA. I’m just not in the right place in life to take advantage of your Macro opportunity, mores the pity. Somewhere down the track hopefully. 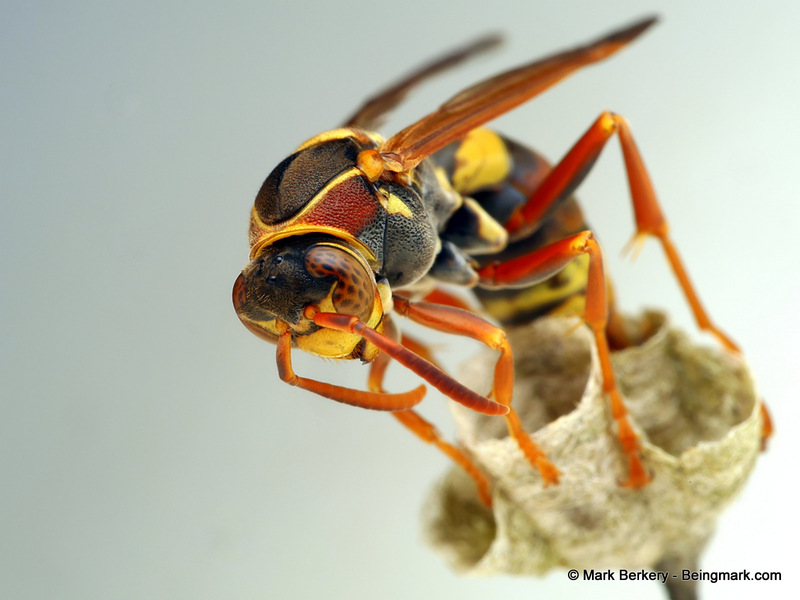 Beyond gorgeous shots of the paper wasp. The shot of her with her egg was very touching. Such is circumstance. Thanks Lissa. Your macro photography invitation sounds great, but I am in Melbourne and I think you are in QLD somewhere, so unfortunately too far away. I don’t think I’ll be giving macro up any time soon. But you never know, a ton of bricks could convince me any time. Great series Mark. Do you know what the 3 spots on her head are? They almost look like eyes. 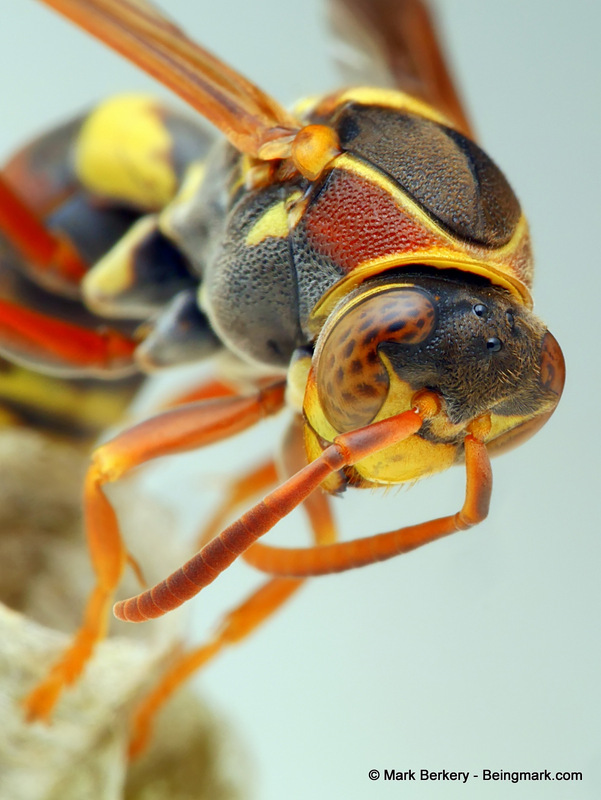 I suspect the simple eye that is often found on the top of an insects head serves survival from attack from above or behind, supplementary to the larger compound eye they usually have as well. Probably registering the more basic changes in environment, like dark and light. I love and admire your photos, but I really love the close-up shots here, especially that last one. The wasps here are building up high, under the eaves. So, protected from the elements and prying cameras they’re thriving. And if I was up your way I’d definitely do the macro experience. Brilliant Mark. 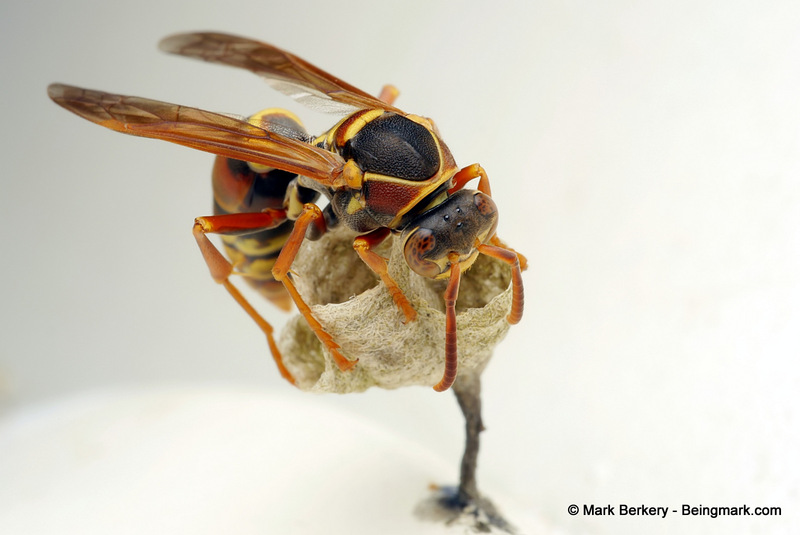 Nasty sting, but fascinating to observe. Yes, I have watched a nest through a spring with many young come and go. Up close it’s a form of discipline, isn’t it.